The aerial bundle cables for overhead distribution lines have an insulated or bare neutral messenger made of AAAC, which the insulated aluminum phase conductors are helically wound over it. Cables are rated at 0.6/1kV and conform to IEC 60502 or SANS1418. The phase conductors shall be of H68 Condition aluminum conductor and circular stranded. 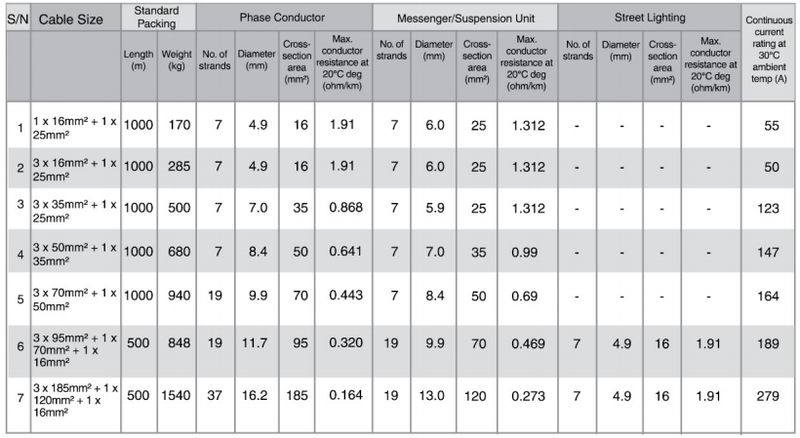 The neutral messenger conductor shall be of aluminum alloy conductor and circular stranded. The street lighting conductors shall be of H68 Condition aluminum conductor and circular stranded. The phase, messenger and street lighting conductors shall be extruded with cross-linked polyethylene (XLPE) as insulation. The cable consists of insulated phase and street lighting aluminum conductors, shall be held firmly onto the neutral messenger aluminum alloy conductor in a right-hand(Z) direction of lay. ►Ease of erection and stringing. ►Relative immunity to short circuits caused by external forces (wind, fallen branches), unless they abrade the insulation. ►At junction poles, insulating bridging wires are needed to connect non-insulated wires at either side. ABC can dispense with one of these splices. ►Less risk of a neutral-only break from tree or vehicle damage, increasing safety with TNC-s systems. Electricity theft is made harder and more bvious to detect.